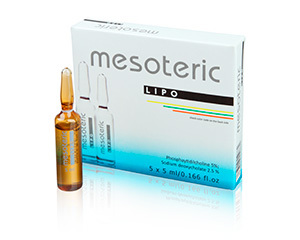 Description: Association of active ingredients lipo active indicated in the treatment of hydrolipodystrophy for its ability to metabolize fats and produce energy. Acting on the mobilization of free fatty acids by facilitating their metabolism resulting in increased lipolysis by increased cAMP. Indications: localized adiposity, hydrolipodystrophy, lymphatic stasis. Active Ingredients: L-carnitine 10%, Ginko biloba 0,2%, Biotin 0.1%, Caffeine 1%, Mangnesium gluconate 0,2%. Description: Enhances significantly the synthesis of the coenzymes involved in anabolic processes reducing adipose tissue. Its cleansing action stimulates the lymph draining system reducing the retention of fluids built up in the tissues and reduces oedema and the feeling of swelling. Reduces localized water retention. Active Ingredients: Cynara scolimus leaf extract 0,5%, Hedera helix 1%, Centella asiatica extract 0,5%, Fucus vesiculosus 1%, Cumarin 0,5%. Description: Facilitates the fat metabolites release from adipocytes via increasing the permeability of cell membranes. Emulsifies fat and enhances its elimination in form of o/w emulsion from the subcutaneous tissue. Indications: hydrolipodystrophy, local fat deposits. Active Ingredients: Phosphaytidilcholine 5%, Sodium deoxycholate 2,5 %. Description: Combination of active ingredients which stimulate biochemical pathways that promotes skin tissue repair and regeneration. They promote the formation of collagen and elastic fibres which give the skin its softness and suppleness. Synergistic interaction of multiple growth factors with other proteins in epidermis and dermis results in skin repair and regeneration. Indications: Chronological ageing and photo ageing, stressed skin, skin flaccidness and decreased tonus, dry skin, striae and scars, acne, hyperpigmentation, demodicosis, alopecia. Active Ingredients: Ascorbic acid 1%, N-acetyl cisteine 0,25%, Tiamine 0,003%, Taurine 6,25 mg/ml, NAD 0,02%, Copper peptides 0,5%. 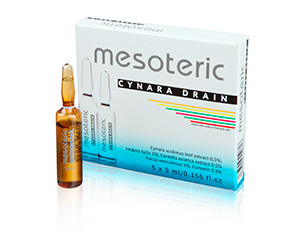 Description: Stimulates the skin renovation and rejuvenation, rehydrates and recovers the lost volume. Reduces the wrinkles’ depth and smoothens mimic wrinkles. Triggers the synthetic activity of fibroblasts. Indications: deep wrinkles, expression lines, ageing, dry, skin. Active Ingredients: Sodium Hyaluronate 0,5%, Pantotenic acid 1%, Zinc gluconate 0,1%, Glycerol 0,2%, Sh-polipeptide-9 0,001%. Description: Neutralizes the excess of free radicals produced in our body and helps to maintain an oxidative balance. Combination of active with antioxidant properties with ability to reduce or prevent some amount of the oxidative damage that destroys and depletes the skin’s function and structure while also preventing some of the degenerative effects in skin caused by sun exposure. 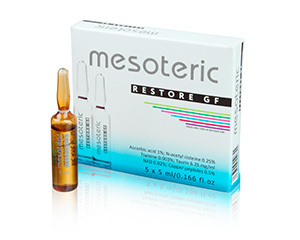 Indications: Chronological ageing and photo ageing, stressed skin, skin flaccidness and decreased tonus. Active Ingredients: Ubiquinone 0,5%, Nicotinamide 0,01%, Ferulic acid 0,25%, Sodium chondroitin sulfate 0,1%, Sodium DNA 0,2%. Description: Association of active ingredients which acts stimulating dermal collagen production, resulting in retraction of collagen fibers, compacting and performing a tightening effect in flaccid states. Attenuates and smooth wrinkles caused by sagging. Improves the firmness and increases skin elasticity. Indications: Chronological ageing and photo ageing, skin flaccidness, striae. Active Ingredients: DMAE 0,5%, Sholigopeptide-2 0,005%, Zn gluconate 0,02%, Thioctic acid (lipoic acid) 0,02%, ATP 0,01%.